The most visible manifestations of urban violence encompass physical and psychological harm against persons – from homicide to other forms of victimization. For more than a century social scientists have also studied the ways in which violence reconfigures social and spatial relations and triggers cycles of insecurity and fear that span generations. 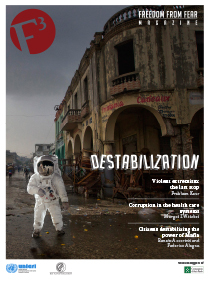 There is also evidence that “structural” forms of urban violence arising from the degradation of urban economies and austerity measures can equally contribute to a “break down” in social life leading to new forms of violence. 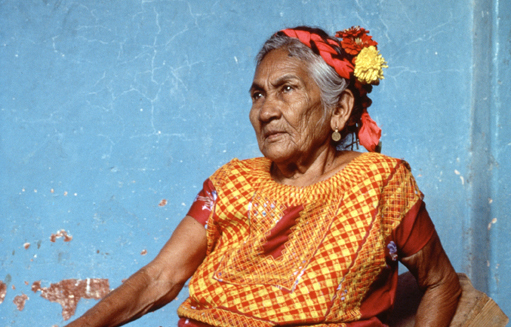 An especially disconcerting manifestation of urban violence is found in Mexico. In just a few years, Mexico’s war on drugs has claimed between 30,000 and 60,000 lives with most of these intentional deaths concentrated in the northern states. The country’s national homicide rate rapidly increased over the past few years from 8.1 homicides per 100,000 in 2007 to 23.7 homicides per 100,000 in 2011. The homicide rate supposedly declined, albeit marginally, to 22 per 100,000 in 2012. The overall escalation in violence was linked to deployment of more than 60,000 soldiers by former President Calderon and subsequent inter-cartel violence. What is especially unsettling is the appalling brutality, the symbolic and ritualized nature of violence, often intended to send messages to secure territory and expand influence. In order to fully apprehend the full extent of Mexico’s urban violence crisis it is necessary to consider its geographic dimensions. The consideration of the geography of criminality is not without precedent. Indeed, human geographers and sociologists have studied spatial aspects of criminal behavior and criminality for more than a century. A particular focus of these scholars is on the ways in which the built-up city – and in particular its rapid growth – influences individual social bonds within communities. Many of them argued that increased proximity engendered networks that were temporary, transitory and instrumental and in some instances, contributed to a rise in neighborhood crime and criminal violence. These insights soon gave rise to the so-called theory of social disorganization. Contemporary formulations of the theory suggest that it is not principally the ethnic or “identity” composition of specific settings that are the principal drivers of neighborhood crime, but rather the real and relative absence of social support networks, social capital, and the inability of communities to sustain collective action. Yet a number of key insights of scholars associated with the so-called French and Chicago schools remain constant today in Mexico. Specifically, drug-related and property crimes are highly spatially concentrated, as is the tendency of criminals to live close to areas where they operate. It is for this reason that certain city areas can be classified as “crime endemic”. There is an array of competing explanations for what contributes to the causes of social disorganization and the spatial concentration of violent crime in so-called “hot spots”. Certain scholars contend, for example, that there are typically areas within cities that offer more intrinsic opportunities for criminal activity owing to political neglect and the absence of state presence together with local economic decay. Other geographical findings of social disorganization link higher crime rates with areas exhibiting a higher density of offenders, a higher percentage of rental housing, and large social housing projects. Likewise, the probability of becoming a criminal is also increased if the individual is raised in a highly criminal area. The causal mechanism here is that a higher density of criminals increases the chances of meeting accomplices due to wider network and closer communication between them. Although contemporarily known for spectacular levels of organized violence, Ciudad Juarez is also historically recognized as a key economic engine of Mexico. With a total estimated population of 1.3 million, it holds a disproportionately important manufacturing base. Due to its strategic location at the border with the United States, Ciudad Juarez is one of the most economically important cities in the country. Much like other Mexican cities on the United States border, Ciudad Juarez also exhibits mixed “social dichotomy” characteristics. Indeed, since its founding, the city has experienced complex and often black-market forms of trans-border trade and socio-economic characteristics. During the prohibition era of the 1930s, for example, bars and clubs multiplied in the downtown area just across the border bridge of Juarez-El Paso. Ciudad Juarez has also served as a “gateway” city. Literally millions of migrants have passed through the city or stayed on as short- and long-term residents. For example, between 1942 and 1965 under the Bracero program hundreds of thousands of farm workers migrated to the United States crossing through the city. Following its closure, the city had expanded to almost 400,000 inhabitants. Urban planning was subsequently redirected toward industrialization for the United States consumer market including the hiring of unskilled labor, particularly women in the so-called maquiladoras. Unlike the Bracero program, the maquiladoras initiative continued to attract young workers – particularly women. It also had a socially structuring effect, including the rapid growth of slums, sustained male unemployment, low-paid working mothers and children reared in single parent households. The (unintended) effects of these two programs contributed to a gradual process of social disorganization in Ciudad Juarez. The resultant chronic income vulnerability, successive economic recessions and weak family structures were fundamental in laying the foundations for the onset of violence. The rapid spike in inter-cartel related violence since 2006 served as the trigger. In spite of recent declines, Ciudad Juarez is today one of the most violent cities on the planet. Between December of 2006 and December 2010, some 6,437 homicides were linked to the so-called organized crime war. Yet between 1994 and 2010, just 1,792 individuals were sentenced for committing homicide. In a recent empirical study, we correlated homicide rates in districts falling above and below the arithmetic mean with socioeconomic variables associated with social disorganization in the city. Specifically, the assessment used regression analysis to appraise the relationship between more than 200 independent variables and homicidal violence. We found that there are at least 12 statistically significant underlying demographic and socioeconomic factors that correlate with the above-average incidence of criminal violence in Ciudad Juarez. Many of these “risks” are reported in other settings and include low levels of employment, low access to social security, vacant and inadequate housing, and low levels of education and migration. 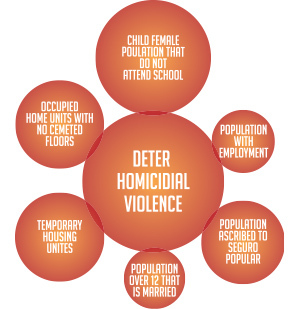 In other words, there are signs that areas characterized by urban poverty and marked deterioration are also susceptible to disproportionately high risks of homicidal violence. Others are more “protective” and are linked to higher rates of education, social cohesion and formal education or schooling. We then graphically visualized these risk and protective factors in a venn diagram to highlight the extent of their statistical influence. The assessment detected 6 specific factors that appear to be robustly associated with higher levels of homicidal violence (see Figure 1). These demographic and socioeconomic factors include population born in another state, population above 15 with more than 9 years of schooling, average schooling among male population, population registered to social security services, vacant housing, and occupied home units with no access to water inside its premises. A number of these variables are intuitive and are associated with the apparently directed forms of armed violence along Mexico’s border with the United States. Yet as we shall see below, others are more counter-intuitive. More important for the purposes of this article, many are predicted by the social disorganization theory. As noted above, there are at least 6 socioeconomic factors that negatively correlate with criminal violence in Ciudad Juarez (see Figure 2). These “protective factors” include female population between 6 and 11 years old that do not go to school, populations exhibiting employment, populations registered to the social program Seguro Popular, populations over 12 that are married, the prevalence of temporary housing, and occupied home units with no cemented floors. Put another way, reported homicide was lower, on average, in police districts exhibiting higher incidence of these factors. In order to develop a sophisticated set of responses to preventing and reducing criminal violence in settings such as Ciudad Juarez it is essential to better understand its underlying causes. Policy makers and their electorates are easily susceptible to narrowly conceived and heavy-handed responses. When reliable and valid information is often missing, it is natural that responses often treat perpetrators and victims in dichotomous boxes. Yet a closer reading of the underlying social conditions of specific urban settings and the spatial dynamics of homicidal violence reveal a more expansive range of alternative entry-points. 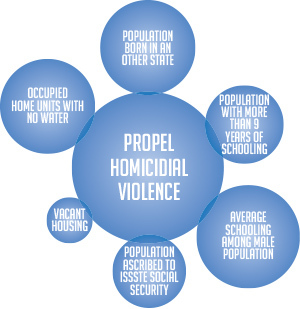 In parts of Mexico and also likely in other similar settings, homicidal violence is not only highly spatially clustered but it is also correlated with a number of compositional variables or social factors. Specifically, we detected a set of underlying risk factors and protective factors operating in Ciudad Juarez between 2009 and 2010. What is more, we found that social disorganization correlates with violence and this premise was partially confirmed, albeit in some cases with some unexpected relationships emerging. Nevertheless, there are some grounds for cautious optimism in Ciudad Juarez. In the wake of massive programs such as Todos Somos Juarez (TSJ) launched in 2010, rates of violence have dropped dramatically. With hundreds of millions spent, TSJ constitutes one of the single largest federal crime prevention initiatives in Mexican history, so questions about its replicability remain. There are also concerns about the extent to which these funds are appropriately targeting risk and protective factors. There is comparatively limited public information about how much, when, and where specific investments are being made. The absence of such data is in large part due to the lack of citizen involvement in public policy making. Without genuine citizen participation and a concerted focus on identified risk and protective factors, it may be difficult to sustain the impressive gains already achieved. Robert Muggah is research director of the Igarapé Institute and director of research and policy at the SecDev Group. Carlos Vilalta is a Research Professor at Centro de Investigación y Docencia Económicas, A.C. (CIDE). The article is based on a larger study completed in 2013 on the geographical and social determinants of homicide in Ciudad Juarez and is part of the www.hasow.org series.